Burnley, with a population of around 80,000, is the smallest town ever to give birth to a Football League Championship winning team. It has the classic image of a Lowryesque mill town of chimneys, and at one stage, looms outnumbered people. And in the football club’s heyday, a large percentage of local folk would shuffle along to Turf Moor to watch the Clarets. Today, the demographics have changed significantly – Burnley has had its multi-racial problems like many towns, and as with most old footballing names, they live in the shadow on bigger, more heralded names. But the club still retains an affectionate following as one of the 12 founder members of the Football League. In the days when playing fields were a damn sight more level than they are today, Burnley still managed to upset the establishment and in 1960, won only their second Football League Championship title. They did it with a young side that some commentators said would dominate the 1960s. That didn’t quite happen, and neither did the similarly-dubbed “team of the 1970s” when Burnley’s next generation came along. But in 1960, all roads led to Turf Moor as an unfashionable club lifted the title, ahead of the more celebrated Wolves and Tottenham. In the days when football clubs were run by butchers, bakers and candlestick makers, to coin a phrase, Burnley’s driving force was a blunt, straight-talking owner of 14 butcher’s shops. Bob Lord was the son of a barber and a local lad. He was desperate to join the Burnley board and was successful at the second attempt. He became chairman in 1955 and his reign at Turf Moor made Burnley one of the most progressive clubs around – on and off the field of play. Lord was far from popular with the football cognoscenti, but he got things done and in some ways, was quite a visionary. He may have been pugnacious and autocratic, but it was Lord who led the movement in football to appoint a team manager to take care of team selection – up until then, directors bought and picked players. Harry Potts, a former Burnley inside left, was Lord’s choice as manager. Lord also transformed Turf Moor into one of the most comfortable grounds of the 1960s, although if the under-seat heating hadn’t proved so expensive in one of the new stands, prompting Lord to switch it off, Burnley fans would have been sitting in the lap of luxury! And Lord also pioneered the famed “football specials”, trains taking fans to away games. The late 1950s represented the start of the so-called “space race” as the US and USSR started to explore the cosmos. Burnley, with its mill-town image and Lancashire earthiness, could not have been more removed from the zeitgeist. But as this was the age of youth, Burnley tapped into the new trend of developing young players in the way that Matt Busby built his “Babes”. From 1955-56 to 1962-63, Burnley never finished lower than seventh in the old first division. In 1958-59, there was little hint that they might sustain a major title challenge, but in some ways, with Manchester United – along with Wolves the dominant force of the age – now rebuilding following the tragedy of Munich, Burnley filled one of the gaps left by Busby’s protégés. 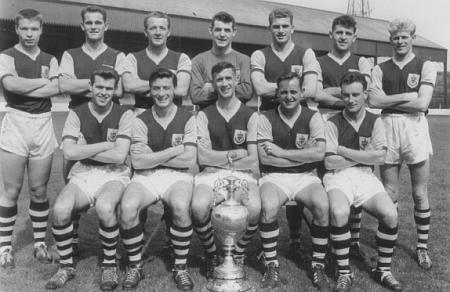 Burnley’s 1959-60 side comprised more than half a dozen home-grown players, and another two who could be considered home nurtured. Potts paid money for one player – Alex Elder – in 1958, but it was another eight years before he put cash on the table for a player. Goalkeeper Adam Blacklaw joined the club’s groundstaff from school and was still only 21 when the 1959-60 campaign kicked off. Full backs Alex Elder – picked up for £ 5,000 from Glentoran as a 17 year-old and John Angus were both kids. The key to Burnley’s side, however, was Irishman Jimmy McIlroy (left), who was a relative “oldie” in the team at 27. He was described as “the brain of Burnley” and was an excellent passer of the ball. 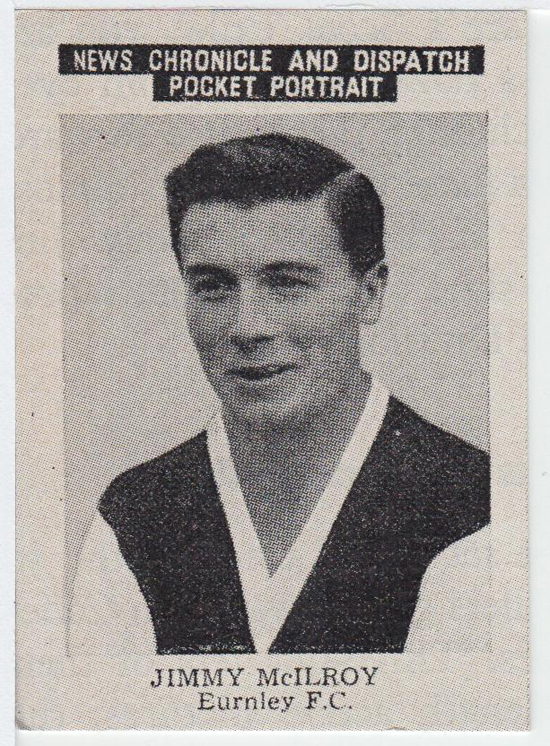 He was partnered by “Mr Burnley”, Jimmy Adamson, who played more than 400 games for the Clarets, mostly at inside forward. Adamson, like fellow wing-half Brian Miller, went on to manage the club. Miller was one of the home-grown starlets and was capped by England. Tommy Cummings completed the half-back line, another youth product who was approaching the veteran stage of his career. Up front, Ray Pointer and John Connelly formed a lethal partnership, scoring 19 and 20 league goals respectively. Pointer, known by the much-used “Blond bombshell” nickname, was a high-octane player who never seemed to stop running. Connelly missed the final, title clinching game of the season due to a cartilage operation, but his contribution, built on pace and cutting inside from the flank to score spectacular goals, was invaluable. He went on to play in the 1966 World Cup as a Manchester United winger. Connelly’s place in the final game went to Trevor Meredith, who scored the winning goal but didn’t receive a title medal. He would today. Brian Pilkington was picked up from Leyland Motors and drove on to make a cameo appearance for England. Jimmy Robson also scored 18 goals in 1959-60, including five in one game against Nottingham Forest. Robson’s picture hangs in almost every football boardroom in the country. It was his goal in the 1962 FA Cup final that is captured in a painting awarded to every member club of the FA. Robson’s goal, for Burnley against Tottenham, was the 100th FA Cup final goal at Wembley. Burnley didn’t top the league table until the very final game, although they were chasing the front two for much of the season. They started well, winning seven of their first 10 games, leaving them in fourth place with a cluster of clubs, and one point behind leaders Tottenham. In November, they beat reigning champions Wolves 4-1 at Turf Moor, a result that highlighted the potential of Potts’ team. Burnley went into 1960 in third place, but had seen their hopes damaged by a 1-4 home defeat against Manchester United, just two days after they had won 2-1 at Old Trafford. When Burnley beat Tottenham 2-0 in March, the media enthused about the exuberance of Burnley’s young side, who were chasing a league and cup double. But when the Clarets went to Wolves at the end of the month, they were four points behind Spurs in top place, but had two games in hand. Wolves gained revenge for their earlier drubbing by hammering Burnley 6-1. Surely, Burnley couldn’t win the league? But with two games to go, Burnley were level on points with Wolves, who had just one left. The title was within their grasp. On the final day of the campaign, Wolves won 5-1 at Chelsea, while Burnley drew, nervously, with Fulham at home. That pushed Burnley down to third place, one point behind Wolves and level on points with Spurs. But Burnley still had to visit Manchester City on May 2. A win would give them their first League Championship since 1921. Brian Pilkington gave them a fourth minute lead, but City equalized in the 12th minute. Trevor Meredith, just 20 and five feet five inches tall, volleyed the winner after a defensive error after half an hour. So Burnley won 2-1 and lifted the title. The team remained one of the best in the land for a couple of years, entered the European Cup in 1960-61 and finished runners-up in the FA Cup in 1962. They were eclipsed somewhat by the Tottenham double side, but they enjoyed their moment in the sun. They took the limelight away from the traditional heavyweights of the game. Wouldn’t it be nice if such a story could happen today? Pingback: Which football champions were top of their league for the shortest time? Next Entry England v Scotland. It makes sense.